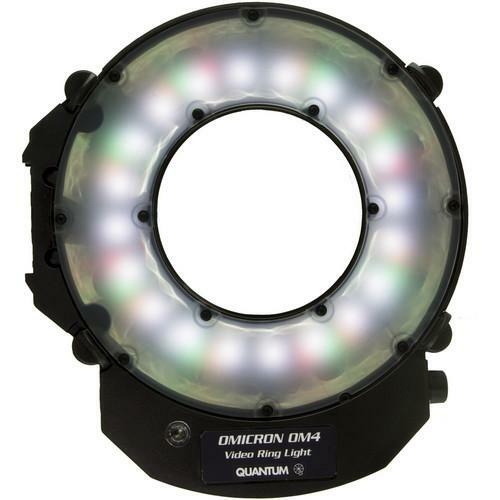 We recommend checking out our discussion threads on the Quantum OMICRON 4 LED Video Ring Light 860450, which address similar problems with connecting and setting up Macro & Ringlights Quantum. The user manual for the Quantum OMICRON 4 LED Video Ring Light 860450 provides necessary instructions for the proper use of the product Photography - Flashes & On Camera Lighting - Macro & Ringlights. The OMICRON 4 LED Video Ring Light from Quantum Instruments is a constant light source featuring an electronically-adjustable color temperature of 2500-6500K. Output level remains the same while making these adjustments. You can save and recall up to 8 temperature settings via pre-sets. The OMICRON 4's colored LEDs fill in the missing color gaps characteristic of white LEDs, producing a full spectrum for natural color rendering. The amount of color correction is calibrated as you vary the color temperature, a feature Quantum refers to as Chromatically Correct LED lighting. The light provides a soft, diffused 60° beam angle and can be used as a ring light or mounted off-camera. It outputs 255 fc / 2700 lux at 1.5', 72 fc / 750 lux at 3', and 17 fc / 170 lux at 7'. Its panel displays and allows you to set dimming level from 100-0%, as well as color temperature and pre-sets. Instant auto exposure tracking maintains illumination level on your subject as you move in and out. The light can be powered via the included AC adapter or by an optional QB8 Quantum Battery and accessory cable OM43, V-mount battery and accessory cable OM41, or Quantum Turbo 3 battery with an OM43 power cable. Runtime ranges from 60-300 min depending upon your choice of battery. The OMICRON 4 can be attached to the QF29 Camera Mounting Bracket or OM42 Video Rail Mounting Bracket. The ring has dimensions of 9.25 x 1.1" and the housing is 2" wide. If you own a Quantum macro & ringlights and have a user manual in electronic form, you can upload it to this website using the link on the right side of the screen. Box Dimensions (LxWxH) 11.3 x 10.4 x 4.3"
The user manual for the Quantum OMICRON 4 LED Video Ring Light 860450 can be downloaded in .pdf format if it did not come with your new macro & ringlights, although the seller is required to supply one. It is also quite common that customers throw out the user manual with the box, or put the CD away somewhere and then can’t find it. That’s why we and other Quantum users keep a unique electronic library for Quantum macro & ringlightss, where you can use our link to download the user manual for the Quantum OMICRON 4 LED Video Ring Light 860450. The user manual lists all of the functions of the Quantum OMICRON 4 LED Video Ring Light 860450, all the basic and advanced features and tells you how to use the macro & ringlights. The manual also provides troubleshooting for common problems. Even greater detail is provided by the service manual, which is not typically shipped with the product, but which can often be downloaded from Quantum service. If you want to help expand our database, you can upload a link to this website to download a user manual or service manual, ideally in .pdf format. These pages are created by you – users of the Quantum OMICRON 4 LED Video Ring Light 860450. User manuals are also available on the Quantum website under Photography - Flashes & On Camera Lighting - Macro & Ringlights.